Cambridge, MA - Addgene has been named one of the Top Places to Work in Massachusetts in the ninth annual employee-based survey project from The Boston Globe. 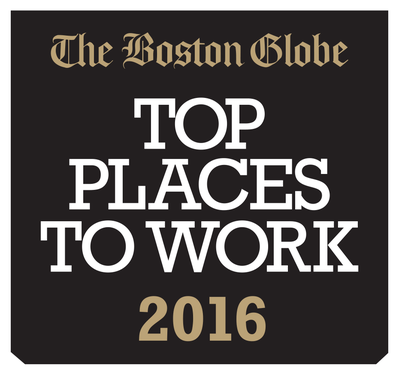 The Top Places to Work 2016 issue will be published online at BostonGlobe.com on the night of November 17 and in The Boston Globe Magazine on November 20. Top Places to Work recognizes the most admired workplaces in the state voted on by the people who know them the best—their employees. The survey measures employee opinions about their company's direction, execution, connection, management, work, pay and benefits, and engagement. The employers are placed into one of four groups: small, with 50 to 99 employees; medium, with 100 to 249 workers; large, with 250 to 999; and largest, with 1,000 or more. Addgene was ranked #1 in the small company category. Addgene, the nonprofit plasmid repository, is able to fulfill its mission to the scientific community through the amazing work of its employees. Affectionately known as Addgenies, employees enjoy perks such as a 100% company-paid health insurance, 8 weeks paid parental leave, professional development opportunities, and much more. Fueled by the unlimited coffee supply, Addgenies also work together to make the office fun – planning cook-offs, book clubs, ping-pong tournaments, and other group activities. “Addgenies are passionate about helping scientists around the world share their research materials. This passion is evident in our workplace – the vibrant atmosphere, collaborations across teams, and innovative ideas,” says Joanne Kamens, Executive Director. “Together Addgenies have built a culture of respect, collaboration, and fun”. “In today's tight job market, competition for the best workers is intense”, said Larry Edelman, the Globe's business editor. “Our winning companies know that creating a motivating and supportive environment is key to finding and keeping talent”. The rankings in the Top Places to Work are based on confidential survey information collected by WorkplaceDynamics, an independent company specializing in employee engagement and retention, from nearly 70,500 individuals at 366 Massachusetts organizations. The winners share a few key traits, including offering progressive benefits, giving their employees a voice, and encouraging them to have some fun while they're at it. Top Places to Work online extras include sortable rankings and photo galleries. All can be found at the Boston Globe's website. Readers can follow the news on Twitter at #workboston. Addgene is a 501(c)3 nonprofit biorepository dedicated to facilitating scientific discoveries by operating a plasmid library for researchers. The repository contains over 50,000 plasmids contributed by more than 3,000 research labs around the world. Over a half million plasmids have been distributed to 85 countries by Addgene - with 11,000 plasmids currently shipping each month. By authenticating, storing, archiving, and distributing plasmids and their associated data, Addgene is creating a lasting resource for research and discovery scientists around the world. For more information, please visit https://www.addgene.org/.